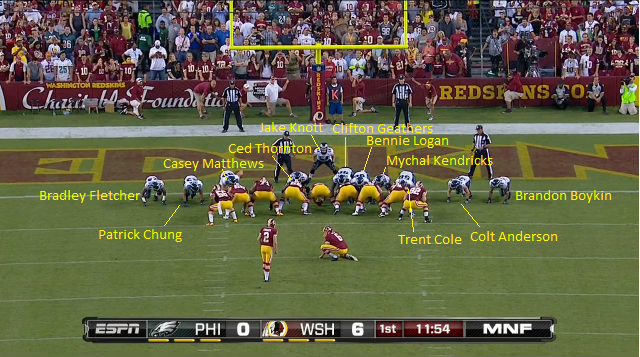 Just about all of my readers can probably name the left guard on Eagles offensive plays, but who lines up there on punts? 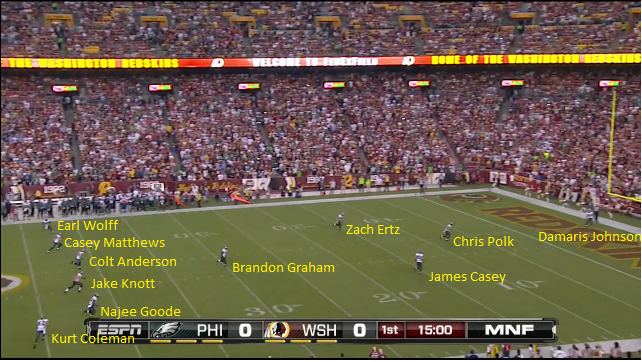 Sure you can name the return man, but who are the other 10 Eagles on the field for kickoffs? 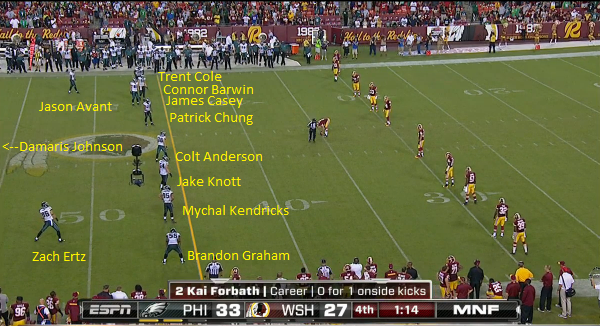 Team depth charts don’t even list entire special teams units. 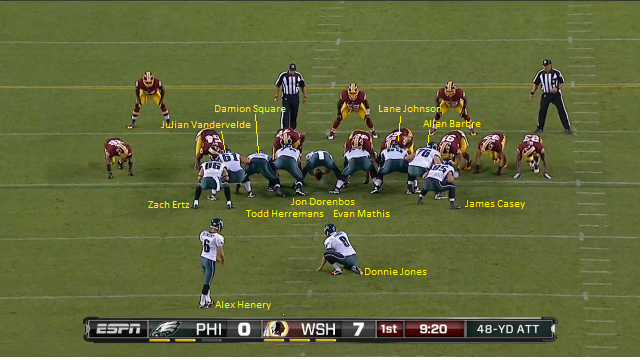 Note: On the Free Kick following the safety, it was the same formation as above except Brandon Graham was off with Damaris Johnson taking his spot (odd swap) and DeSean Jackson back to catch the kick. Edit: Jimmy Kempki pointed out that there was just one WR (Jason Avant) playing up on the “hands team.” First, would anyone like to guess the last time the Eagles were onsides-kicked-at? … Week 6 of 2010 vs Atlanta. Yikes. Not enough late leads these last few years. That one is a bad comparison because it wasn’t clear if the Falcons would kick it deep or not, but earlier that year against Detroit, the Eagles had 3 WRs up on the hands team (Hank Baskett, Riley Cooper, and Jason Avant). Also, Zach Ertz could be considered a debatable choice given that he did not demonstrate good hands in college and has elicited frustration from Derek Sarley for having catching issues. Conversely, Avant didn’t drop a single ball last year, per Pro Football Focus. 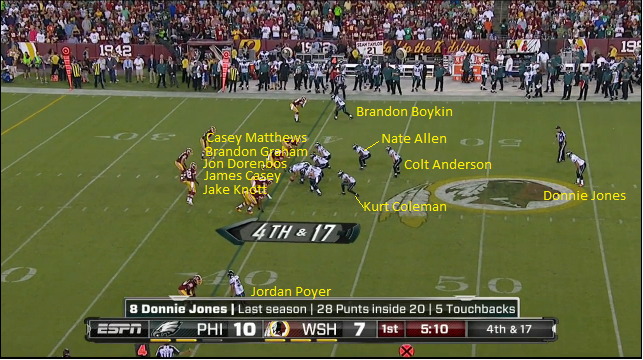 Edit Edit: Upon watching a whole bunch of onside kicks from last year, some teams use WRs more, others TEs. One WR not abnormal. Either Johnson or Jackson back to field it. Also note Damion Square at LT. 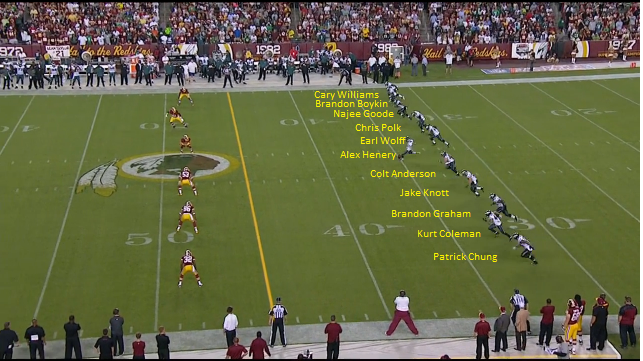 The Eagles carry 7 active OL, and I suppose they don’t want Jason Peters out there on STs, so they tell Square to stand there and hold his ground. Update: I have a post advocating a shotgun formation on kneel downs using intuition and data to support the claim. 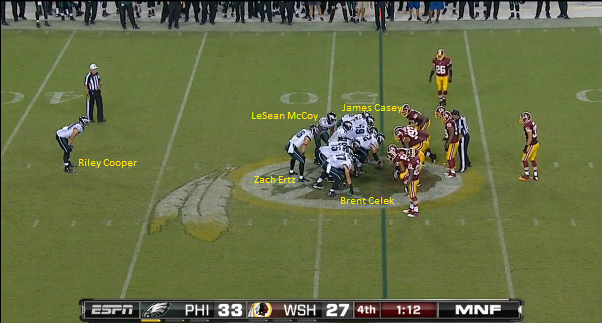 ***DEN actually lined up in a normal formation on the infamous kneel-down. But they deserve as much ridicule as possible.